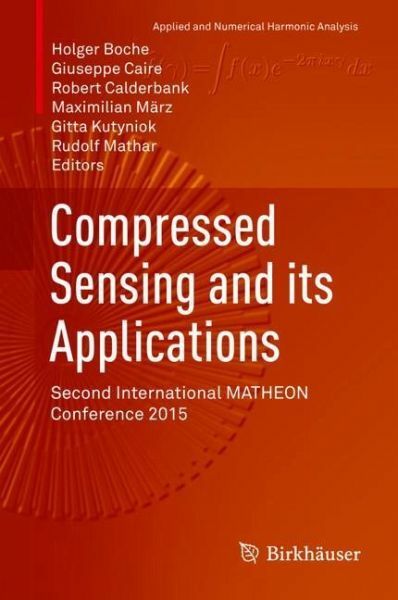 This contributed volume contains articles written by the plenary and invited speakers from the second international MATHEON Workshop 2015 that focus on applications of compressed sensing. Article authors address their techniques for solving the problems of compressed sensing, as well as connections to related areas like detecting community-like structures in graphs, curbatures on Grassmanians, and randomized tensor train singular value decompositions. Some of the novel applications covered include dimensionality reduction, information theory, random matrices, sparse approximation, and sparse recovery. 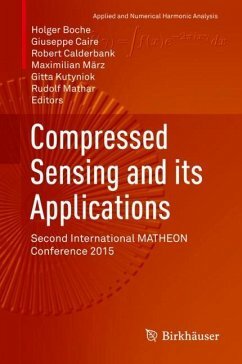 This book is aimed at both graduate students and researchers in the areas of applied mathematics, computer science, and engineering, as well as other applied scientists exploring the potential applications for the novel methodology of compressed sensing. An introduction to the subject of compressed sensing is also provided for researchers interested in the field who are not as familiar with it. Preface.- On the Global-Local Dichotomy in Sparsity Modeling, Batenkov, Romano, Elad.- Fourier Phase Retrieval: Uniqueness and Algorithms, Bendory, Beinert, Eldar.- Compressed Sensing Approaches for Polynomial Approximation of High-Dimensional Functions, Adcock, Brugiapaglia, Webster.- Multisection in the Stochastic Block Model using Semidefinite Programming, Agarwal, Bandeira, Koiliaris, Kolla.- Recovering Signals with Unknown Sparsity in Multiple Dictionaries, Ahmad, Schniter.- Compressive Classification and the Rare Eclipse Problem, Bandeira, Mixon, Recht.- Weak Phase Retrieval, Bothelo-Andrade, Casazza, Ghoreishi, Jose, Tremain.- Cubatures on Grassmannians: Moments, Dimension Reduction, and Related Topics, Breger, Ehler, Gräf, Peter.- A Randomized Tensor Train Singular Value Decomposition, Huber, Schneider, Wolf.- Versatile and Scalable Cosparse Methods for Phsyics-driven Inverse Problems, Kitic, Bensiad, Albera, Bertin, Gribonval.- Total Variation Minimization in Compressed Sensing, Felix Krahmer, Kruschel, Sandbichler.- Compressed Sensing in Hilbert Spaces, Traonmilin, Puy, Gribonval, Davies.